Are you bracing yourself for the coming summer months? Forget the heat for once, as there is a lot to look forward to this summer. Summer weddings and summer vacations to be precise! I know I have a lot of summer weddings to attend this season, and there is no way that I can carry myself in silk saris or heavy lehengas in this sweltering heat. I was browsing through various outfit options when I came across BIBA’s newly launched collection of suits and salwar kameez. I love BIBA for the fact that there is always something for every occasion. Also, the colors and silhouettes that they come up with are always very fresh, unique and on trend. 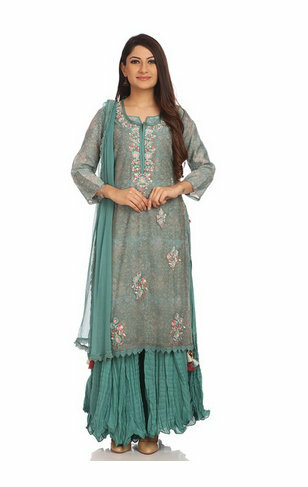 Here are the salwar suits I am buying for myself for various occasions. Something formal yet traditional for a formal dinner? I found my answer in this straight cut red cotton suit, perfect for those sultry summer nights where you don’t want to be too dressed up. This piece makes sure you stand out. Just throw your hair back in a high sleek pony and carry a fancy clutch, and you are good to go! When you hear the words ‘pool side’, all you can think of is lots of color, quirk and fun. 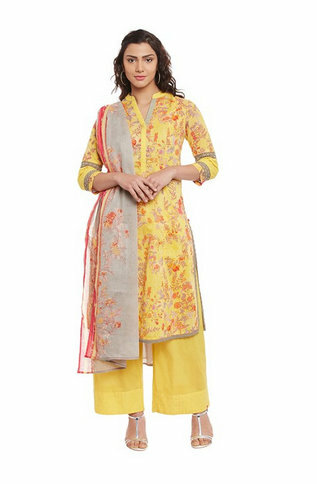 I chose this comfortable and bright yellow printed kurta with bottoms featuring chikankari at the hemline. The color is perfect for an outdoor function and can be worn with with colorful sunglasses, and lots of colorful jewelry. A lovely combination of turquoise and a deep peach color! With brocade work and gold print, this is a perfect look for a summer wedding. The cool color is pleasing on the eyes and looks traditional enough to pull off during a wedding without punishing yourself in heavy silk sarees. This is another one of my favorite colors, and it would go perfect for a mehendi or a haldi function at home. 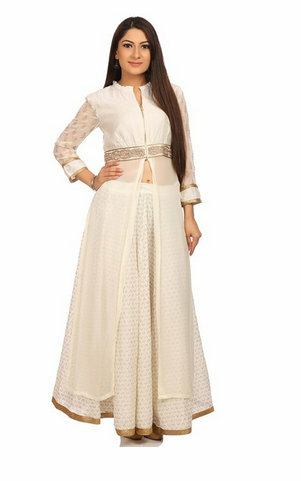 After palazzos, my favorite way to pair kurtas is with a lehenga or a skirt. I love the drama and the flare that the combination gives, and it’s perfect for any festive occasion. Brunch requires you to be both fancy and comfortable. 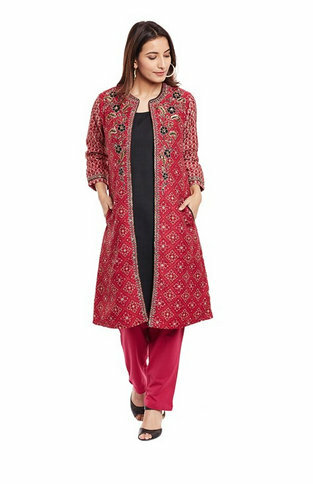 So I stuck to a fail safe combination of a beige kurta with floral thread work, and a bright red palazzo with matching dupatta. Classy and sophisticated, I can gorge on yummy drinks and food throughout the brunch and still be appropriately chic. A grand royal look, for a grand function! A mirror work top, zari embroidered jacket and a skirt with a lovely border. Twirl away and put your best foot forward in this piece! We can’t do a summer wedding without something white now, can we? 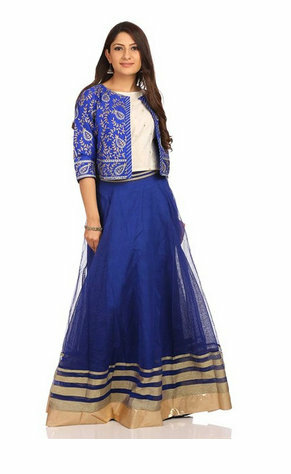 A jacket style kurta with embroidery and a zipper, paired with a gorgeous lehenga with gold print. This is a subtle way of making a statement and making sure all eyes are on you on the dance floor. I totally love this piece and can see myself wearing this many a times! I guess by now you can tell that I simply love palazzos. What can I say! They suit me, they are comfortable and they never go out of style. So there’s always that one function involving just your friends. 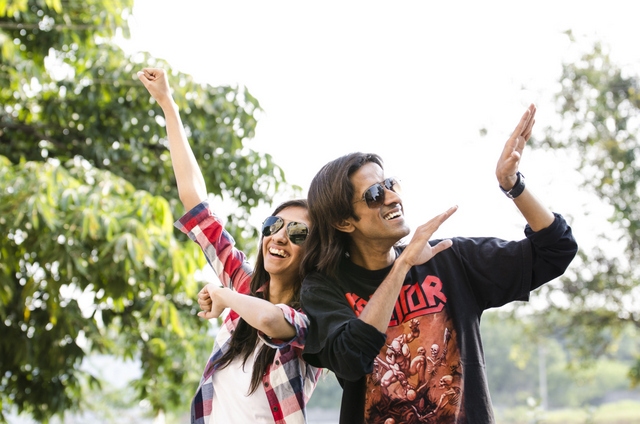 Be it a lunch or dinner or simply a get together for no reason because why not! You only get married once and so you get to have as many functions/parties as you want. Bright and simple, this would be my go-to pick for such an occasion. So these are my ten picks for all the functions that I will be attending. Which ones are your favorite?